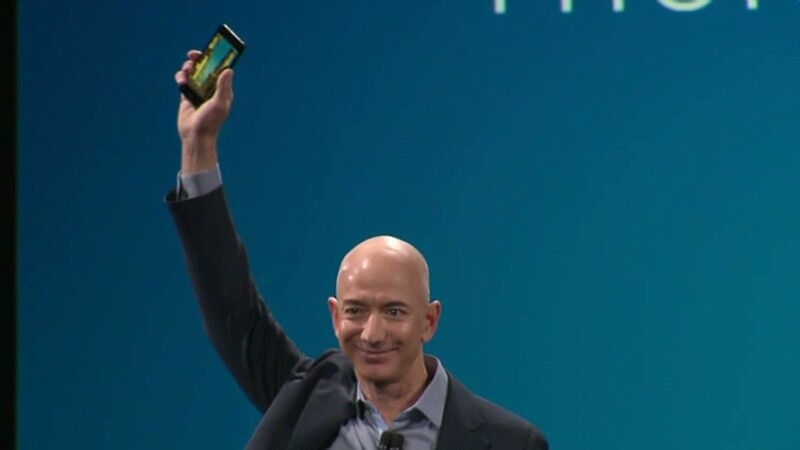 Amazon entered the smartphone business Wednesday -- and made a big splash doing it. At an event in Seattle, the retail giant unveiled the Fire Phone, a high-end, 3-D smartphone. It is the first smartphone Amazon (AMZN) has produced on its own. "Can we build a better phone for our most engaged customers?" asked Amazon CEO Jeff Bezos at the event. "Can we build a better phone for Amazon Prime members? Well, I'm excited to tell you that the answer is yes." Display: The Fire Phone has a 3-D, 4.7-inch high-definition display. It uses infrared lights and cameras mounted on the phone's surface to track a user's head movements and render images accordingly. Bezos compared the Fire Phone's 3-D feature to the introduction of geometric perspective and the vanishing point in 14th century artworks. "We're thinking maybe we can improve on that a little," he said, noting that the company began working on the dynamic perspective feature four years ago. Bezos demonstrated the Fire Phone's dynamic perspective feature on a 3-D map of a nearby area in Seattle. Titling the phone to the side while looking at map offered additional information -- including search results for nearby restaurants. He then tilted the phone for Yelp reviews. When looking at products online, Bezos tilted the phone side to side to scroll. When reading news articles or books, you can tilt the phone to scroll. "There's a better way to scroll on this phone because of the dynamic perspective.... It's a very natural, easy, one-handed gesture," Bezos said. "I think you can probably imagine what the dynamic perspective technology can enable for gamers." Camera: The Fire Phone has a lightning-fast quad-core 2.2 GHz processor, 2 GB of RAM, and a 13 Megapixel camera. The camera comes with an optical image-stabilization feature, letting the shutter stay open four-times longer than most cameras to counteract hand tremors when taking photos. A special button on the side launches the camera and takes photos -- rather than having to go into the phone to open the camera feature. The Fire Phone also includes unlimited photo storage on Amazon's Cloud Drive. Apple (AAPL) and Google (GOOG) offer similar services, but they both charge storage fees. Amazon's "Firefly" feature uses the camera to recognize physical objects -- books, video games, food, household products and other items -- and gives you the option to buy all that stuff instantly on Amazon. Bezos demonstrated with a collection of objects on a table. Firefly can also listen to songs a la Shazam. Like with the camera, there's also a dedicated Firefly button on the side of the Fire Phone. "Firefly recognizes over 100 million different items, and it does so under real world circumstances," Bezos said. "Firefly is so easy to access, customers are going to love this." Media: Media consumption, unsurprisingly for an Amazon devce, is the Fire Phone's focal point. "We have made video awesome on this phone," Bezos said. The Fire Phone's second screen feature can fling videos to Amazon's Fire TV or any Mirrorcast-enabled device. An "X-ray" feature provides details about what you're watching, and Amazon's "ASAP" tool uses predictive software to caching videos it thinks you will watch -- and make them immediately available for streaming. Amazon said competitors will be included in those tools as well, including Netflix (NFLX), HBOGo and ESPN. Reading is also a highlight on the phone, Bezos said. An "Immersion Reading" feature lets users read and listen to a text simultaneously. "We lavished attention on this phone for reading," he noted. The Fire Phone also recognizes TV shows -- demonstrated with a short clip of Game of Thrones -- and gives you the precise moment in the episode and IMDB info.. It also recognizes works of art, giving you Wikipedia information. Other stuff: Amazon's Mayday customer service feature, already in use on tablets, will also be available on the Fire Phone. It includes 24/7 access to tech support in 15 seconds or less. Amazon's smartphone also features dual stereo speakers, with premium earbuds included. It includes aluminum buttons and steel connectors. The Fire Phone will cost $199 with a two-year contract, available exclusively on AT&T's (T) network for the time being. It is currently available for pre-order on Amazon's website, and it will begin shipping on July 25. The phone will also come with a year of Amazon Prime included for both new and existing members, as a limited time offer.